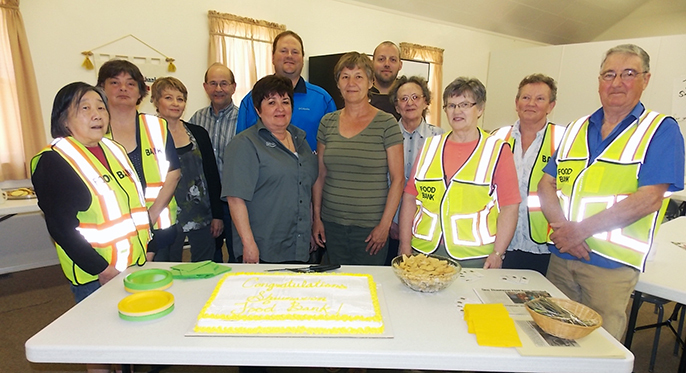 The Shaunavon Food Bank celebrated their first anniversary on Monday, May 2. The organization was excited to invite the community to share coffee and cake and view their facilities at All Saints Anglican Church Fellowship Hall. Chairperson, Lorretta Hughes introduced the committee members, Christine Lax, Dave and Peggy Griffin, Richard and Joy Frenette, Sandra Wood, Janet Meek, and Allen Marks. They are dedicated volunteers who have worked many hours over the past year. Richard Frenette gave a brief history of the previous year. The Food Bank has an executive who conduct regular meetings as well as a board of directors. They now have incorporation and non-charitable status. This allows them to issue income tax deductible receipts for donations. Over the past year, while the Food Bank was establishing an operating facility, they delivered hampers and bread to their clients’ residence. Now, clients will come to the Food Bank facility for food hampers. The hours of operation are Monday and Thursday, 2:30 – 4:30 p.m. Bread, buns, and pastry will be available for clients during opening hours as supplies last. To receive a hamper, phone 306-294-9111 and make an appointment for Monday or Thursday. Kyle Bennett, representing the Town of Shaunavon, expressed their appreciation and commended the Food Bank on their organization. Shaunavon councillor Garrett Thienes was also on hand for the event. The Food Bank thanked Affinity Credit Union representative Delana Floberg for their support and grant which enabled them to purchase a cooler, shelving and needed supplies. The Shaunavon Co-op, represented by Sherry Callahan, was thanked for their generous support and for partnering with Federated Co-op for a successful food drive last fall. Also thanked were the numerous businesses and individuals of Shaunavon and area, and the Swift Current Salvation Army. With their support the Food Bank delivered 6,000 pounds of food in 2015 and another 7,228 pounds in 2016. This included bread distribution to 34 families and hampers to 37 families. Bread also was delivered to Rock Solid Refuge and neighbouring communities. The Shaunavon Food Bank is very appreciative of All Saints Anglican Church of Shaunavon for partnering with them and sharing their facility. The Food Bank is very thankful for everyone’s support and looks forward to continuing to serve the southwest community. If anyone would like to volunteer they can reach organizers by phoning 306-294-9111.